Hello from Paris! Right after my flight landed, I made a beeline from Charles de Gaulle Airport to Nord Villepinte, where the famed design fair Maison & Objet is held twice a year. I had no idea the fair was so huge—nor that it tended, in such extremes, toward the chintzy, glamorous, and/or cutesy. But once I made my way through the gauntlet of candle displays and damask curtains and discovered Hall #8 (entitled "Now! Design á Vivre") I knew I was in the right place. Scores of booths from many of today's most exciting design talent proffered both their latest wares and their best-sellers, in a colorful jumble of creativity that made my head spin. One of my favorite discoveries was the four-year-old company Eno Studio, which commissions projects from emerging and established designers, many of them French. 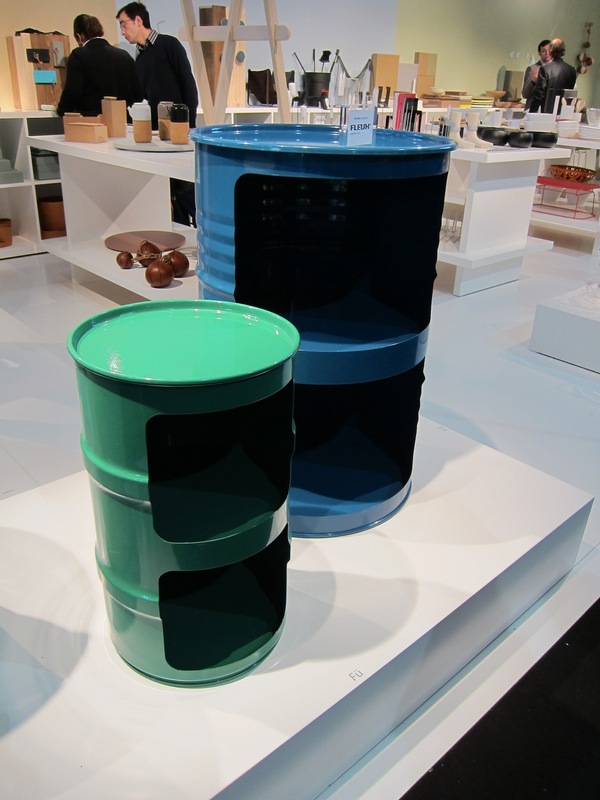 Here's one of the products they premiered at the fair: storage made from recycled oil drums painted in glossy hues, designed by Fü. I especially like this red version. Also at Eno: these ceramic kitchen canisters, shaped like gears and bound together with a thick red rubber band. Normal Studio created this wacky plant atrium/modular support system, as well as the cork and terra-cotta bird feeder in the foreground. I'm including this photo to show what can happen when you turn a corner in an otherwise innocuous row of booths. Some people were going crazy for this booth but it nearly gave me hives. Indoor 'urban gardening' quickly revealed itself as a trend this year. I've culled some examples for you. These cute danglers are 'BacSacs.' The company also makes larger modular grids that sit on the ground. German company Authentics spotlighted Patric Nadeau's 'Urban Garden' series, which included these softly geometric zip-up canvas planters. Nadeau also created these sleek hanging planters. Side note: I love this simple, perhaps Japanese-inspired soap dispenser—another new product from Authentics. This display was one of the more creative at the fair: vegetables dangling on clear thread, above an array of 'Bacsquares' by BACSAC. Another, rougher way to create a vertical garden (the 'Pot Suspendu' from BACSAC). Sentou's booth displayed their modern, kidney-shaped table in new hues. DCW/Lampes Gras exhibited their classic lamp silhouette in new colors (including a lovely brick red) and new forms, including this version that mounts from the ceiling. I loved most things at Muuto, known for their fresh Scandinavian designs. They just unveiled a whole fleet of new designs, including two visible in this photo: their first couch ever, the 'Rest,' which I will attest is incredibly comfortable; and the 'Bulky' tea set, which comes in white, gray, and a bright perky yellow. Vincent Van Duysen's ceramic-and-oak bowls aren't new (he designed them for When Objects Work in 2005) but I think they are just beautiful. Seeing them again, especially in such busy surroundings, reminded me of how timeless and sensual they are—and how much I'd love a stack in my kitchen! Stay tuned for the next dispatch from Maison & Objet, coming soon!